Plumber first fixed the Code 6 property, mastic pointing was completed also to the Code 6 property and joiners fitted windowboards and constructed the pipe boxings. In the Code 4 property the structure was sealed ready for the air tightness test. Nuaire installed the ducting for the ventilation system to both properties. 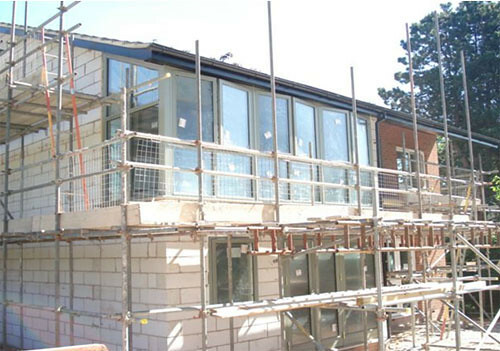 Joiners completed the insulation and studwork to the sunroom walls and sloping ceiling, windows were fitted to the 1st floor section of the sunroom and electrician’s wired the Code 6 property. The structure was sealed ready for the air tightness test. Plasterers have boarded, dabbed and skimmed the Code 4 property and the groundworker’s bricklayers have completed the splash brickwork to the extended boiler store. Martin Grant Health & Safety Manager visited site on Wednesday 3rd June, no issues were raised and paperwork was found to be in order. See the full report in News. If zerocarbon standards were adopted across the UK they would avoid emissions of 26 MtCO2 compared with continuing to build to 2006 standards. This is why it is imperative that we make sure that builders and suppliers know what is needed and how it may be achieved as they plan construction.